There are no technical qualifications for AAAP membership. The club includes salesmen, nurses, mechanics, homemakers, teachers, retirees, etc., as well as professional scientists. Students at all levels are welcome and age is no barrier; the AAAP includes teenagers through centenarians. You will be prompted to login or create a new account. You must be logged to access the online form. AAAP members attend monthly indoor meetings, September through May. Many meetings are held at the Carnegie Science Center or Allegheny Observatory. Increase your knowledge of astronomy and/or skill of observing through the collective knowledge and comradery of the membership. Reduced subscription rates to “Astronomy” and “Sky & Telescope” magazines, and reduced membership dues to The Astronomical League. During the fair-weather months, members attend “star parties.” Hundreds of visitors may gather to gain eyes-on experience at a wide variety of portable telescopes, including some very large models that give incredible views of celestial objects. The AAAP has access to rural observing sites in the Western Pennsylvania area that are excellent for viewing faint telescopic objects far from the interfering sky-glow caused by poorly designed electric lighting. Members have regular access to the club’s own observatories, the Nicholas E. Wagman Observatory in Deer Lakes Regional Park (near Tarentum, Allegheny County), and the Mingo Creek Park Observatory in Mingo Creek Park (Washington County). Members-only star parties are held several times a year. Both facilities are located on hilltops as far away from major sources of “light pollution” as possible. The buildings feature a unique roll off roof design that shows almost the entire sky from inside the building. Members can attend training sessions to learn how to use the telescopes, and then use the facilities on their own. Special award certificates, such as the Messier, are offered to challenge members’ observing skills and knowledge of the celestial map. Beginner’s-level through advanced certificates are available. Members can borrow club-owned equipment, such as telescopes, eyepieces and star charts, through the “AAAP Loan Procedure”. The AAAP adheres to a member-approved Constitution and By-Laws. All members are eligible to run for any office. Membership in the AAAP allows you to be part of an organization that has since 1929 provided education and outreach in the Greater Pittsburgh Area. Through membership, members assist in making astronomy and science education available to the public and to members. K-12 or fulltime college student. All family members must reside at the same address. A portion of your dues are a tax-deductible donation that helps support our educational mission. 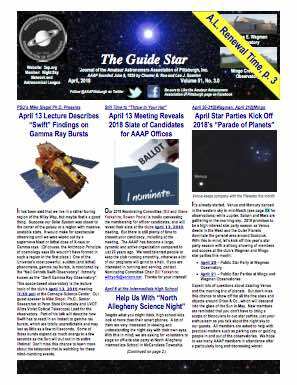 The Amateur Astronomers Association of Pittsburgh, Inc. is a 501(c)(3), not-for-profit organization. Donations support our mission to promote the advancement of the science of astronomy through public education programs and scientific research. You may join or renew your current membership using our ONLINE FORM. You will be prompted to login or create an account. You must be logged in to access the online form. You may also download a membership application form.